I've stumbled across this info before, but can't find it now. I plan to mount reservoir similar to the image below. How far forward from the front of the foot box can these be mounted before I have interference (with the strut for the hood I believe)? I placed the near reservoir about 5" from the front of the foot box, and just barely clear the strut with the far reservoir. Do you have a measurement from the foot box to the far reservoir? I have different reservoirs that what I had pictured. Thanks! The strut brace is right at about 12" from the front of the foot box at the 3/4 top square tube. Perfect - I think this markup is showing what I'm asking for and Papa has provided. 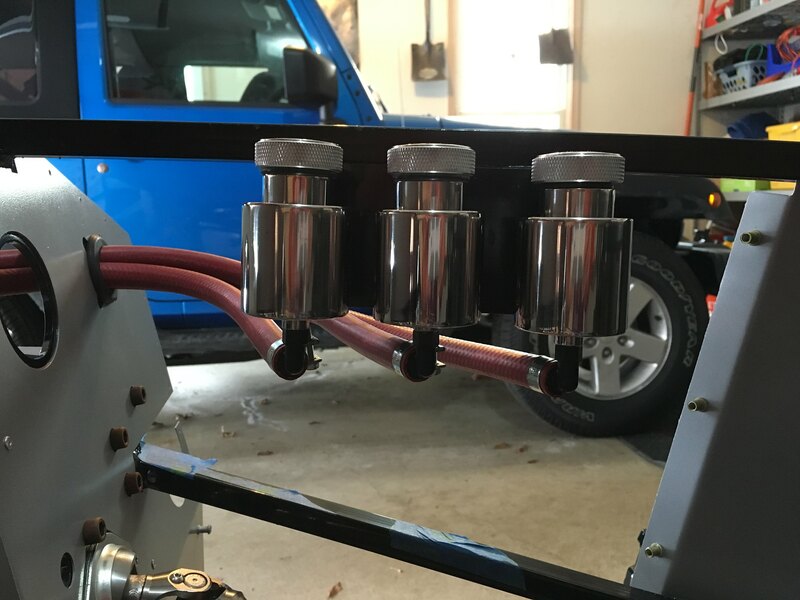 Make sure that when you mount them that they are higher than the master cylinders. I almost didn’t mount mine high enough. Not to hijack this thread but where did you get/obtain the back mounting plate for your reservoir mount? I am in the process of converting my single FFR kit supplied reservoir to a dual CNC setup and need to get a little creative with mounting them. If I'm going to go through the hassle of doing this, it sure would be nice to back the reservoirs with a nice shiny piece such as the one you show. The picture I posted earlier was actually a photo I found when I was trying to figure out how to install mine. I made the backing plates. It's actually a little overkill. One piece of sheetmetal with an angle bent at the top attached under the 3/4" frame tube sandwiched with a second of the same shape attached to the back of the 3/4" frame tube. Last edited by CDXXVII; 01-05-2019 at 01:33 PM. In relation to the frame that the Triple CNC mounts to in the pictures shown, are the top of the caps even with the rail? Here's a view of the max measurement from the footbox to the hood support. I lowered the hood and inserted my finger, in-line with the rear of the support mounting bracket. Approx 12 1/2"
Do you mount the reservoir level with the ground or follow the angle of the frame? I mounted mine level to the ground. Not sure it makes a difference but i tend to overthink everything.